The Criminal Law emphasis program at Fowler School of Law, effective fall 2016, provides a tailored education to students interested in pursuing careers as prosecutors or defense attorneys. As with all of Fowler Law's emphasis programs, students learn from experts in their field to gain a competitive edge upon graduating. Students who complete the Criminal Law program will receive a certificate and transcript notation. In addition to the specialty coursework, students are encouraged to complete an externship for elective credit. Employers that hire graduates in this area rely heavily on the records built by students who have worked in the offices of prosecutors or defense attorneys while in school. 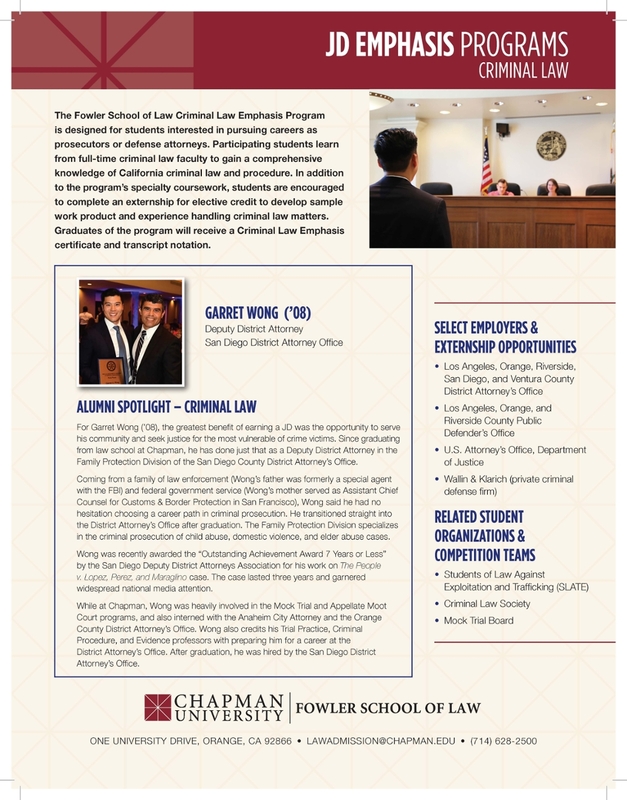 The Fowler School of Law Externship Program provides a useful resource for all students in building experience while also earning course credit. This course is designed to enable law students to deal with substantive criminal law problems in both practical and policy terms. There is inquiry into the proper scope and objectives of the criminal law, limitations on the State’s power to define criminal liability, and general principles of liability and defenses for offenses against the person and property. The course also provides an opportunity for critical examination of statutes at an early stage in the law student’s career. This course provides a close examination of the laws of criminal investigation. Topics include constitutional limits on arrests and stops, search and seizure, interrogation of suspects, right to counsel and the privilege against self-incrimination. This course exposes students to the mechanics of criminal litigation. It will study the stages in the criminal process from charging through sentencing. There will also be instruction in advanced legal writing techniques and students will produce written briefs of the type frequently filed in trial courts in criminal litigation. The course will give heavy emphasis to California practice and procedure, although there will be some consideration of competing approaches taken in other jurisdictions. Learning will proceed primarily through simulated exercises in which students will act as lawyers litigating the various stages of a criminal case. Grading will be based on performance in the simulated exercises as well as several written exercises. Students must take Criminal Procedure: Police Practices before they may take this course, which replaces Criminal Procedure: Adjudicative Process. This course is strongly recommended for students interested in practicing criminal law. Students in this course need not have taken Evidence or Trial Practice. This course will satisfy the Practical Writing Requirement OR the Lawyering Skills Requirement; one course cannot satisfy both requirements at the same time. After students have completed these courses, they should undertake externships and/or part-time or summer employment, preferably with an employer with which the student would like to obtain a full-time position after graduation. For good cause shown, a student may be allowed to satisfy one of the approved electives with an externship of two credits. Students will be able to engage in legal analysis and reasoning as required for the competent practice of criminal law. Students will research legal issues effectively and efficiently. Students will demonstrate the ability to write effectively as needed for the competent practice of law. Students will demonstrate an understanding of and an ability to engage in the professional conduct expected of practicing attorneys, and the ethical standards set out in the ABA model rules, required to competently represent clients and to provide for an effectively functioning legal system. Students will be able to diagnose problems confronting clients, understand clients’ objectives, and generate strategies to achieve those objectives. Faculty members have extensive professional experience as prosecutors and criminal defense attorneys.